Boston Bruins training camp has been open for only four days now and hockey news is already hitting us from all directions. Welcome back to hockey, folks. Let’s get started. The first big news of the pre-season came on Saturday with the announcement that forward Frank Vatrano will miss three months of the season after tearing ligaments in his left foot. The 22 year old showed flashes of NHL ability in 39 games with the Bruins last season, posting 11 points and constantly showing off an impressive shot. Between that and his incredible 55 points in 36 games in the AHL last season, many prepared to slot him in as Boston’s third line left wing this season, or perhaps even imagined him securing a right wing spot on one of the team’s top two lines. Vatrano’s injury will prevent him from playing a full NHL season this year, but it opens up competition for a winger spot on Boston’s roster. At the start of camp, it appears that Danton Heinen, Seth Griffith, and Austin Czarnik are the most likely candidates to take that spot. All three are offensively talented centers who have also played the wing. Heinen, who is entering his first professional season, will have to really impress to make the NHL roster out of camp, as opposed to Griffith, who played 30 games in the NHL two seasons ago and posted similar numbers to Vatrano in that stint. Given the talent Boston has in these prospects, the three month loss of Vatrano will certainly be lessened if another prospect can step up and earn a spot on the roster. 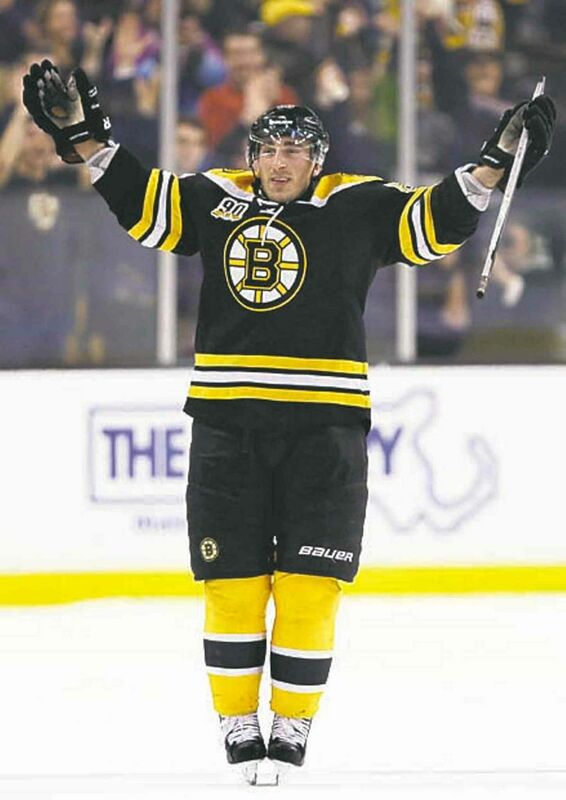 Monday morning bore the news of left winger Brad Marchand’s 8 year, $49 million contract extension that will keep number 63 in Boston through the 2024-2025 season. This contract comes after Marchand’s career high in goals (37) and points (61) last season and his five points in four games in the World Cup of Hockey this month, trailing only Team Canada linemate Sydney Crosby. Marchand’s play in the past year has finally convinced the hockey world that he is one of the league’s elite left wingers, and in particular some wondered whether Marchand would consider signing in Pittsburgh to play with Crosby on the Penguins when his current contract was up. Re-signing with Boston only a day after these rumors were posed is a great show of of love for Boston and faith in the team’s ability to remain competitive. Marchand’s new $6.125 million cap hit that kicks in next season will make him Boston’s fourth highest paid player, but he easily could have earned close to $2 million more per year in free agency. The contract’s length is questionable-Marchand is locked up until he is 37, and there’s no guarantee he’ll remain as productive for that long- but as a whole, this is a victory for Boston general manager Don Sweeney. Bruins fans can count their blessings tonight- Marchand and Patrice Bergeron are under contract for less than $13 million per year. Monday night is Boston’s first pre-season game against the Colombus Blue Jackets at TD Garden. Though there are no stars playing tonight, it will be our first look at newcomers to the Bruins organization, such as Danton Heinen and Riley Nash, as well as a look at how hot prospects Jake Debrusk, Brandon Carlo, and Jakub Zboril have progressed going into their second pre-season with the Bruins. Boston’s full lineup for tonight can be found on their website. Anton Khudobin and Zane McIntyre are scheduled to play goalie.